This is submitted to ask response on the complex issues facing Business as Mission innitiatives. It is only preliminary and is in no way intended to be comprehensive but only exploratory. Please join me in this conversation. Business as mission (BAM) suffers from a general lack of recognition and deep analysis outside academia and a relatively small community of marketplace and missions practitioners. My project focuses on particular obstacles, including that lack of notoriety, to the widespread deployment of primary resources (manpower and capital), and how those obstacles are recognized and being addressed by mission agencies launching BAM initiatives. Mark Russell, in the “Statement of the Problem” of his 2008 doctoral dissertation (The Use of Business in Missions in Chiang Mai, Thailand, Asbury Theological Seminary, 2008) cites Ted Yamamori and Ken Eldred as saying that one downfall of the “Western missionary movement…was its failure to mobilize many business professionals (beyond using their money) for the Great Commission.” (Yamamori and Eldred 2003:7). Even as some advances are being made, that status remains relatively unchanged. Succeeding in business is difficult. BAM initiatives are most needed in locations geographically and culturally foreign to those most able to undertake them and likely to succeed. The degree of difficulty added to business venture by these two components is raised yet again by the need to address Christian missional concerns, including the theological grounding of the actors involved and of the entire enterprise, ethical accountability, and evangelistic intent and impact. 6) the organizational sophistication and capacity for BAM of sending mission agencies. Figure 1.1. 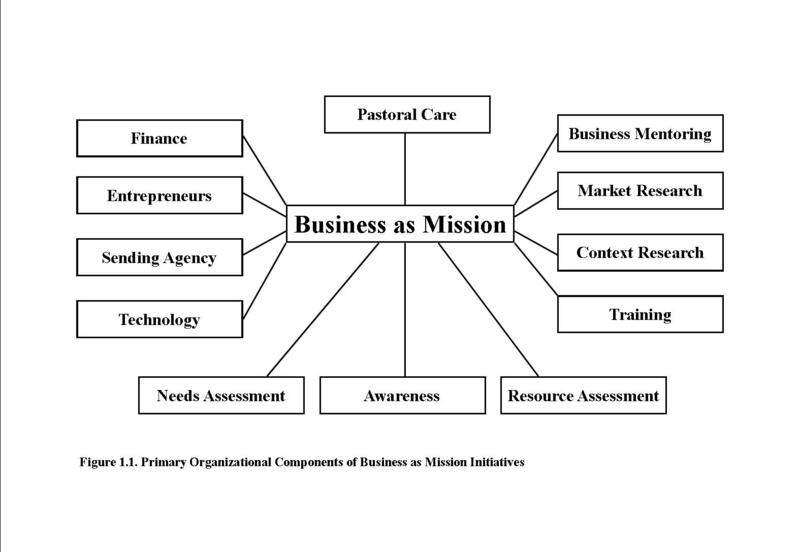 Primary Organizational Components of Business as Mission Initiatives shows twelve key elements connected with each business creation. There has been no intentional ordering of these key elements in the diagram other than that of placing Pastoral Care in a predominant position to indicate the vital importance that all BAM initiatives be carried out with spiritual and ethical accountability to the local church. The list of elements included is by no means exhaustive and considering the extent of issues subordinate to these twelve quickly reveals an intense complexity in the overall scheme of undertaking BAM initiatives. This complexity is compounded by viewing BAM as an interdisciplinary undertaking, the (re-)integration of business and ministry which have been falsely bifurcated historically as the doing of business as a Christian and the exercising of the practitioner’s Christian faith were compartmentalized both practically and philosophically. The general lack of awareness of BAM can be easily documented anecdotally by speaking with a wide range of marketplace Christians, their pastors, and missionaries. This is likely due to BAM, as a formal proposition, having risen into the view of mission agencies and missiologists in just the past decade or two. Actual BAM work has been going on for centuries, as many cite the Apostle Paul, the tentmaker, as the first self-proclaimed bi-vocational (a misnomer) missions practitioner. Domestic (U.S.) ignorance of other cultures around the world and the arrogance of U.S. exceptionalism often results in demeaning patronage, philosophic imperialism, and resentment among those in receiving locations. The cultural bent among U.S citizens toward addressing issues head-on and dictating solutions, too often like a bull in a glass factory, results unawares in insensitivity which renders “serving the poor” an awkward misstatement of the intended effort. Marketplace Christians sent as BAM practitioners will require preparation and training, not the least for working cross-culturally but also in areas such as contextually appropriate business modeling and technologies. Indigenous BAM practitioners may require extensive education in business development and practices. Both groups need to be recruited as awareness of needs and opportunities for BAM are defined in a broad range of locations. Each location targeted for BAM initiatives presents a unique set of circumstances involving local cultural, the needs and opportunities within the community, assessing available (and missing) resources, and understanding the local and national business climate, especially in relationship to local, regional, and national governance. This requires well planned and executed strategies to optimize the success of both the businesses created and the ministerial aims of the mission agency and the local church. Deployment and coordination concerns not just to the effective ministry of particular marketplace expertise but also to the wide variety of BAM experiences and lessons learned. Sending marketplace Christians into the mission field, whether for short or long term assignments, should be well-documented such that a clearinghouse could provide vital data to enhance and expedite other BAM initiatives. Information and expertise could then be more effectively matched and deployed as the various assessments surrounding each new BAM initiative are completed. The church is a divine enterprise and its ministry outreach to the world requires organizational development and information management no less so than any other charitable or commercial endeavor. Best practices in undertaking complex tasks are nowhere more critical than in the advancing God’s Kingdom on earth. Sadly, many church and mission agencies neglect understanding the finer points of organizational development. Lacking adequate knowledge leads to marginal success, especially when coupled with limited capacities to anticipate and handle those complexities. This is an area in particular the church can learn from the highly motivated business world to maximize the penetration and impact of BAM initiatives. I am announcing to the world that I am “officially” launching my quest to write a doctoral dissertation. I am particularly interested in the topic of mobilizing marketplace Christians for advancing the Kingdom of God through the business and mission movement. Right now I am “chasing” my thesis. I am interested in the various perspectives on mobilization from mission agencies and conventional missions practitioners, Western pastors who want to empower their people interested in business and mission, marketplace Christians with lagging knowledge of what is happening and how they can be involved, and so on. The best way to help me right now is to pose questions that come to mind as you think of this movement from your particular perspective. I wish I could be less vague about what it is I am asking but that is the nature of a discovery quest…I am not sure exactly what I am looking for but will know it when I find it. Please join me in this conversation. I believe the marketplace will play a leading role in the spread of Christianity in the coming decades and will experience incredible transformation from the inside out as we seek to know and follow Christ as we go to work.